"Hank the Cowdog has seen dry summers in his years as the Head of Ranch Security, but nobody on the ranch has seen a drought like this. Ponds have dried up, the creek is down to a trickle, pastures have turned to burned toast, and the cows are kicking up clouds of dust. Then, to top it all off, Pete the Barncat hatches a dastardly plot to ruin Loper’s birthday! The last thing the cowboys need is a prairie fire, but that’s what they get, and it begins to look like the next roundup might be their last. What the ranch really needs is a good rain to bring back the grass . . . and Loper’s good mood!" 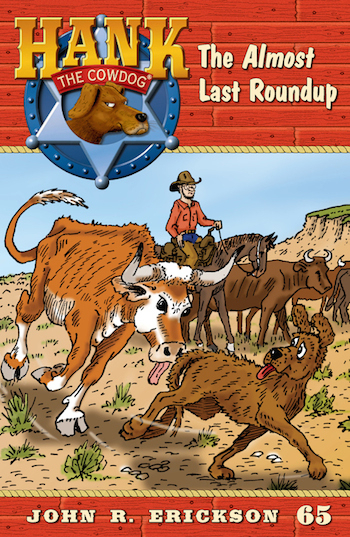 Hope you enjoyed the sneak peek at "The Almost Last Roundup," and be sure to keep an eye out for upcoming contests, book-details, and Fan-Zone additions from now until March 16th!